After pacing the race last year Samuel Ndungu won commandingly in his debut performance, writes Ken Nakamura. 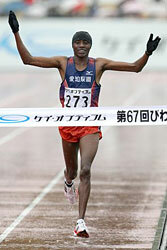 On Japanese soil only Sammy Wanjiru's 2:06:39 is faster, when he won Fukuoka in 2007. Behind him Henryk Szost set a new Polish record. Ryo Yamamoto surprised with a three-minute improvement, to finish fourth and first Japanese. Along with Arata Fujiwara, who was the first Japanese in last week’s Tokyo Marathon, Yamamoto is likely to be selected for the London Olympics. With the Olympic team berth on the line, the race for the first Japanese changed twice in the last 5km of the race. Hiroyuki Horibata, led at 35km, but was passed by Kentaro Nakamoto at 38km. Behind him Yamamoto was gaining steadily and caught the fading Nakamoto on the track with 400m to go. Of the top 10 finishers, nine set either personal bests or contested their marathon debut. A huge pack of fifty-five runners passed 10km in 30:12 and around forty were still together passing through halfway in 1:03:38. The pace picked up after 25km and Ndungu emerged as leader of an eight-man pack after 29km as they headed home into a headwind. The 25-30km split was the fastest of the race (14:51), but Ndungu only began to open a gap on the others after 31km. Hilary Kimaiyo's 2:08:17 performance last year set the bar high, but the 24th edition had a palpable buzz that built all week in Torreon. Erick Monyeye emerged victoriously, but it was the Mexican performances and the fiesta atmosphere that dominated. Five Mexican men ran under the 2:15 Olympic standard. On the women's side Marisol Romero and Karina Perez fought out a thrilling duel to see who would join Medai Perez in the Mexican Olympic team. The desert town sits at 1000m altitude in fertile irrigated land where the dairy conglomerate Grupo Lala, which stages the race, runs a thriving international business. Their race thrives too, with a cap of 4500 entries and female participation which this year reached 20 percent. Cool conditions favoured fast times, but the men's race was tactical from early on. A group of five Kenyans and seven Mexicans passed halfway in 1:05:56, but split up after 25km, with Oscar Ceron the only Mexican among a Kenyan trio of Monyeye, Isaac Kimaiyo, and Joseph Mutinda. Ceron slipped back as Monyeye began to assert himself, eventually taking charge in convincing style from 33km. In contrast, the women's race left the drama to the final stages. Six were clear as early as 10km and by halfway (1:16:52) four remained: Angelica Sanchez, Romero, Perez and Genoveva Jelegat. By 25km Sanchez was slipping back, but at 35km the lead trio were still stride for stride. 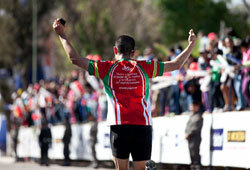 Romero only managed to break away over the final 2km as they circled the beautiful Bosque Venustiano Carranza park. There were matadors and bulls running, mimes, stilt-walkers, packed grandstands and wedding proposals at the finish line as Mexican marathoners celebrated a day of peace, joy and friendship amidst the violence that has so shaken their country. Thomas Wittek who won the last edition before last year's cancellation because of the "Arab Spring" took up where he left off by winning the first 23km stage through the 30m dunes of the Saharan Erg, although time gaps were slight and it was more of a tactical win. Alice Modignani, winner of the Chott Marathon extreme, won today's leg ahead of Fabiola Spinelli, winner of the 100km of the Namib Desert. Many runners stayed in the restaurant tent because of the heavy winds and rain during the night. Almost nobody slept, but the weather abated and at 10:30 the sun came out in time for the start of the 16km second stage. Massimo Camozzi came in 10 seconds ahead of Thomas Wittek. Alice Modignani won again but the Englishwoman Jennifer Hands came through into second place. 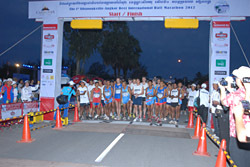 The traditional night stage followed, 7km around the camp at Bir el Ghif. The full moon made the snaking lights of the athletes' headlamps even more fascinating. The tough Marathon stage was held after a night of temperatures as low as -4°C, but this was easier to bear than the normal high temperatures during the race. Spain's Juan Antonio Alegre won the race but Thomas Wittek came in close behind to hold on to the overall lead. Alice Modignani extended her lead and finished 12th overall. During the night, a storm from the north brought cold wind and rain and continued during the race to make the going hard on this 21km stage. The rain did at least harden the sand slightly, making it a little easier to run on the dunes. Alegre tried to attack and although he won the stage and moved up to second overall, Wittek kept him close enough to keep his overall lead. Alice Modignani ran out a clear winner with Jennifer Hands maintaining her second placing. 100 runners from 12 countries were buffeted by 60kph winds and wind chill of -20°C during the race, held on King George Island, off the tip of the Antarctic Peninsula. Near-blinding snow squalls hit as runners passed Artigas, the Uruguayan scientific research base, near the marathon turn point at the western end of Collins Glacier. "Typical for an Antarctic summer day." said Boston-based tour organiser Thom Gilligan. Terrence Bell took an early lead in the men's race, but three women contested closely until 37km, when Brooke Curran surged to the front and went on to win. 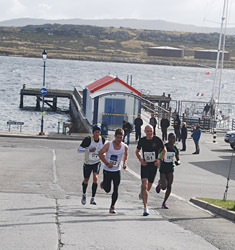 Four Chilean research base personnel, who had been spared the rough two-day crossing of the Drake Passage on the Russian icebreaker Akedemik Loffe, dominated the men's half marathon. 1800 runners enjoyed sunny conditions and stunning views across the lake from the course between Verbania and Stresa. 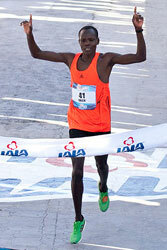 The men's race was a duel between Ethiopian Belaye Bedede and Kenyan Edwin Kipyego. By halfway the two were clear and alternating the lead, until approaching the finish Bedede edged away for a 12-second winning margin. Jemima Jelegat was a clear winner in the women's race with a new course record – almost three minutes faster than Joyce Chepkirui's winning time last year. 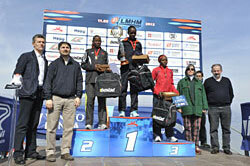 Second and third place finishers, Alice Mogire and Magdalene Mukunzi also bettered the previous record. Nobody would have expected such a competitive race to be staged at Taroudant — one of the most ancient historical cities in the south of Morocco. With more than 1000 participants, an international field with some of the world's top road runners, warm but not too warm conditions, and great spectator attendance: everything required for a top road race was in place. The results showed that both men and women performed to the highest international level: Ahmed Baday even setting a world leading time. Although the contest for places on the Japanese Olympic team was the main focus Albina Ivanova-Mayorova stole the show writes Ken Nakamura. It was the first edition the race as a mass participation event with 15,000 women runners. Running in the second pack until halfway Mayorova made up a 90 second deficit in the next 14km and then ran away from the top Japanese. Naoko Takahashi ran 2:22:19 here in 2000, but Mayorova's time is on a changed course. Of the top nine runners, all under 2:28, Mayorova, Nakazato, Ito and Miyauchi set personal bests. Two all-time greats, Lidia Simon and Catherine Ndereba, did not fare well finishing 19th and 22nd. Noguchi ran ahead of the pacemakers at times but around 17km the Athens Olympic gold medallist began to lose contact. By 20km she was eight seconds adrift. By halfway (1:11:30) seven runners — Yoshimi Ozaki, Remi Nakazato, Yukiko Akaba, Yoko Shibui, Misaki Katsumata, Mai Ito and Yoko Miyauchi — and one pace maker were left in the lead pack. However, as the pace stayed sluggish, Noguchi, who was 24 seconds behind at 25km caught the leaders at 29km. At 32km Ozaki tried to break the pack and Noguchi, Shibui and Akaba all seemed to be in trouble. Mayorova was steadily gaining on the leaders. Soon after 35km (1:59:41) she passed them, breaking up the pack in the process. Only Ozaki, Nakazato and Ito were able to follow her. Ito drifted back after 36km and soon Ozaki and Nakazato were also left behind, perhaps concentrating on the battle for Olympic selection. They passed 1km to go together and 200m behind Mayorova, but with the Nagoya dome in sight and 500m to run Ozaki surged away. 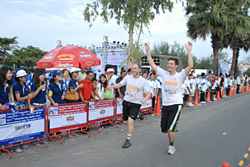 The first edition attracted 1100 runners from 21 countries. 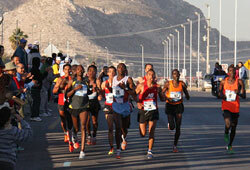 Nearly 15,000 runners fought driving rain and strong winds in the second ever marathon held in the Holy City. Hundreds of police were deployed to provide security along the course, part of which ran through annexed Arab east Jerusalem, and 4,000 Israeli soldiers also ran in a special race along the route. No amount of security could have protected runners from the cold and wet weather. A wave of freezing rain swept over runners as they awaited the 7am start. It was bitterly cold throughout, with driving rain, strong winds and hailstones pounding the runners as they fought their way up Jerusalem's notorious hills. A thousand runners completed the full marathon, 4000 ran the half, and 10,000 joined the 10km race. A total of 1500 foreign runners participated, representing more than 50 countries from as far away as Trinidad and Tobago and Indonesia. Starting from the Knesset, Israel's parliament, the route took runners up and down several hills, through the walled Old City and areas of east Jerusalem, including the biblical Mount of Olives. Israel captured east Jerusalem in the 1967 Six-Day War and later annexed it in a move never recognised by the rest of the world. Palestinians wanted east Jerusalem as the capital of their promised state. "No training in the world could prepare you for the terrain of Jerusalem and the hills," said Noella Pio Kivlehan, a first-time marathon runner from Ireland who completed the race in just under six hours. "There was really good camaraderie among those of us who were among the stragglers. It really helped me when things got difficult." Wilson Loyanae took advantage of cool conditions to break the course record by over a minute. 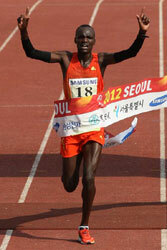 He had run his previous personal best of 2:09:23 in Gyeongju last October. A 12-strong lead group went through 10km in 29:45 and 20km in 59:46. Even at 35km there were still nine runners together, before Loyanae made his bid for victory and started to build an increasing winning margin. The first three to finish broke the old course record. 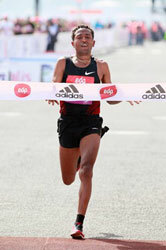 Tadese Feyse led the women's race from the start. A lead group of four passed through 10km in 34:00. By 20km it had become three, and when Flomena Chepchirchir dropped back before 30km it briefly became a contest between Feyse and Askale Magarsa, but after 35km Feyse pulled away to win. Behind them Serena Burla came through after a cautious start to inprove her personal best by almost seven minutes in third place. The men's race was on course record pace until 30km, but the pace slowed in the last 7km due to strong win, writes Diego Sampaolo. Luka Kanda nonetheless improved his previous best of 2:08:40. 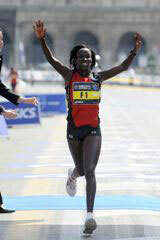 Pre-race favourite Hellen Kimutai ran to form to win the women's race. The men's race set off fast, passing 10km in 29:49. Still fast at halfway (1:03:06) the course record was well within reach at 30km with six in contention (1:29:56). With pacemaking over Kanda and Samson Barmao attacked, Kanda starting to pull away after 32km. Although he slowed after 35km he was not challenged as the record slipped out of his reach. 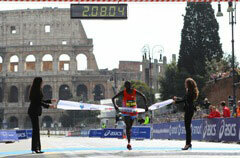 His was the third fastest timnwe run in Rome. The women's race set off at a 2:26 pace for the first 5km, although favourite Hellen Kimutai was 25 seconds behind the lead group of Ethiopians. Kimutai gradually pegged them back over the next 10km and they went through halfway in 1:13:34. Ashete Bekele pulled ahead before 30km with Kimutai in 4th at 30km and up to 3rd by 35km, where she lagged Bekele by 1:07. By 40km she was only 16 seconds adrift and surged past for a confident win. She had previously finished third in 2000 and second in 2007. 12,688 runners crossed the finish-line in Via dei Fori Imperiali breaking the all-time record for the Rome Acea Marathon. The 8th edition of this most southerly certified marathon offered the usual challenging conditions with wind speeds of up to 60kph and the temperature as low as 3°C. To top it off, there were heavy rains later on in the day. A record number of 58 runners took part in the individual race and a further 18 teams competed in the relay. 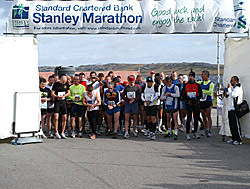 A total of 23 international runners travelled to Stanley to take part in the event, including eleven from Argentina, six from Japan, five from the UK and one from Switzerland. The first three in the men's race were quite close, and all under three hours. Claudia Camargo set a new course record in the women's race. His Excellency, The Governor Mr. Nigel Haywood, officiated at the start of the race before himself running and completing the race in a time of 3:42.14. He then presented the prizes. The proceeds from the race totalling over US$12,500 will be donated to Standard Chartered Bank's nominated charity, Seeing is Believing. Zersenay Tadese won a hat-trick victory, but more than a minute slower than his previous two efforts, writes Antonio Fernandez. High expectations were partly dashed by warm weather — up to 23°C — and moderate winds. Tadese took charge from the start, with John Mwangangi, also second last year, tracking him — but they were never on world record pace. "I couldn't run as fast as last year because I had a flu, and that affectd me", said Tadese after the race. Rui Silva, the first Portuguese, finished in fourth place. "I ran almost alone to finish with a personal best" he said. In the women's race Shalane Flanagan, 2008 Olympic 10000m bronze medalist, finished 80m ahead of Kenyan Diana Chepkemoi who lowered her personal best to 1:09:08. Latvia's Jelena Prokopcuka — who lives in the south of Portugal finished fifth, ahead of first Portuguese Ana Dulce Felix, who finished second last year in 1:08:33. 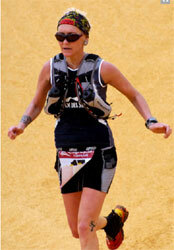 She explained: "Last year I was preparing for the Vienna Marathon (a month later). This year [I am] focused on the Olympic marathon [in August] so I ran slower." More than 38,000 runners crossed the 25 de Abril bridge over the Tagus, in the popular Half Marathon and 8km fun run — but the few dozen elites start separately on the north side of the river to avoid the "drop" coming off the bridge, which would render performances invalid for records. Atsedu Tsegay ran away from defending champion Philemon Limo after 15km in cold and windy conditions to record a world-leading 58:47 and win by a margin in excess of 400m. The 20-year old bested Limo's course record by almost a minute. "In my next race, I would like to try and break the world record" said Tsegay, who ran only 24 seconds slower than Zersenay Tadese's current mark. He improved his previous effort, from Rabat a year ago, by nearly 2.5 minutes. The women's race was also decided at 15km when Joyce Chepkirui eased away from defending champion Lydia Cheromei and Gladys Cherono. She improved her best by nearly two minutes and Cheromei's course record by 30 seconds. This race attracted almost 11000 starters, the biggest ever field for a mass race in the Czech Republic.